© 2002, © 2018 by Paul Freeman. Revised 3/3/18. 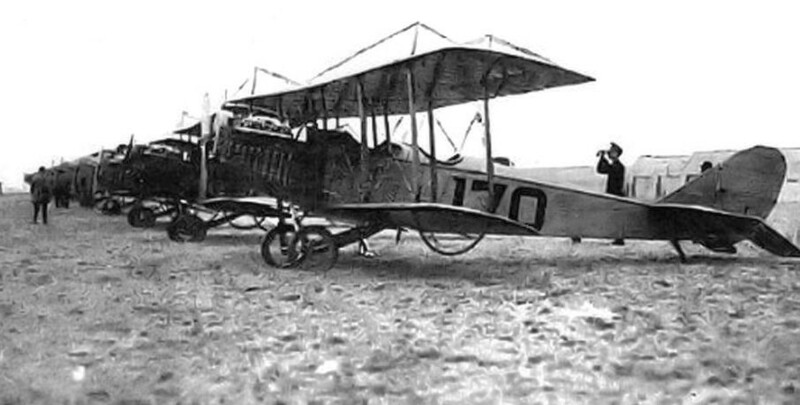 A 1918 US Army photo of JN-4 training aircraft at Payne Field. According to Wikipedia, “Payne Field operated as a training field for the Air Service, United States Army between 1918-20. The airfield was one of 32 Air Service training camps established in 1917 after the United States entry into World War I. It was the first airport constructed in Mississippi. Payne Field was named in memory of Captain Dewitt Payne. Payne was transferred to Taliaferro Field, near Fort Worth, TX. There on 2/1/18, Payne was flying to the aid of a pilot who had crashed into the top of a tree & crashed his own plane in the process. 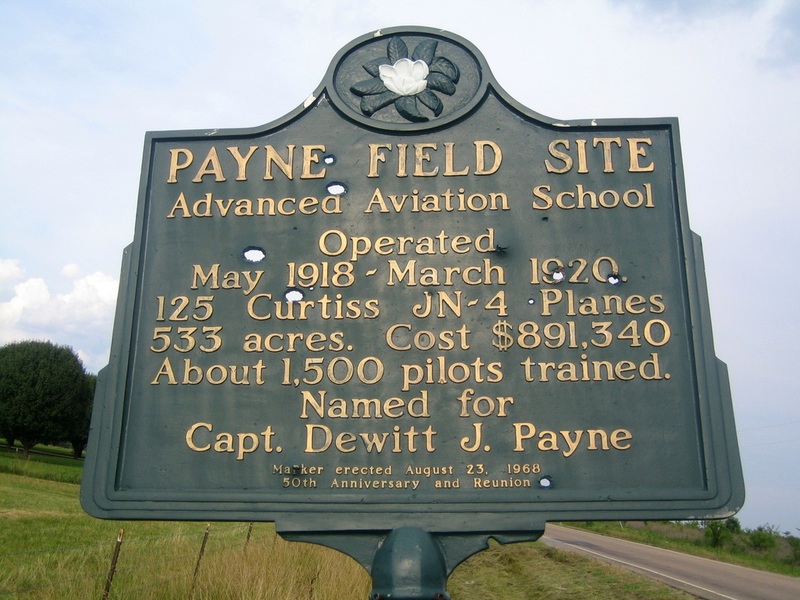 Wikipedia continued, “During World War I, Payne Field was used as a training facility for military pilots. 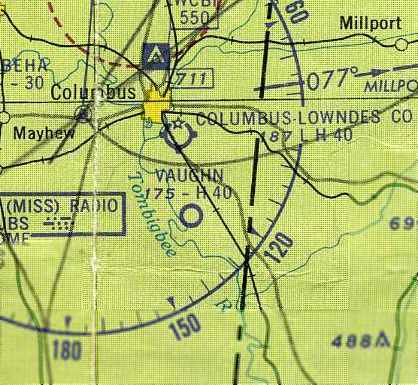 In November 1917, the Department of War sent a cadre of officers to the Columbus, MS area to survey sites for an aviation school. The group decided on a location about 5 miles northeast of West Point, MS. An agreement to lease the land for the Army was concluded. The field consisted of 533 acres & was constructed at a cost of $891,340 & could accommodate up to 1,000 personnel. A 1918-20 US Army photo of a group in front of JN-4 training aircraft & a hangar at Payne Field. Wikipedia continued, “The commander of Payne Field was Lt. Col. Jack Heard. Heard was a career army officer, a West Point graduate (class of 1910), and the son of Medal of Honor John Heard. 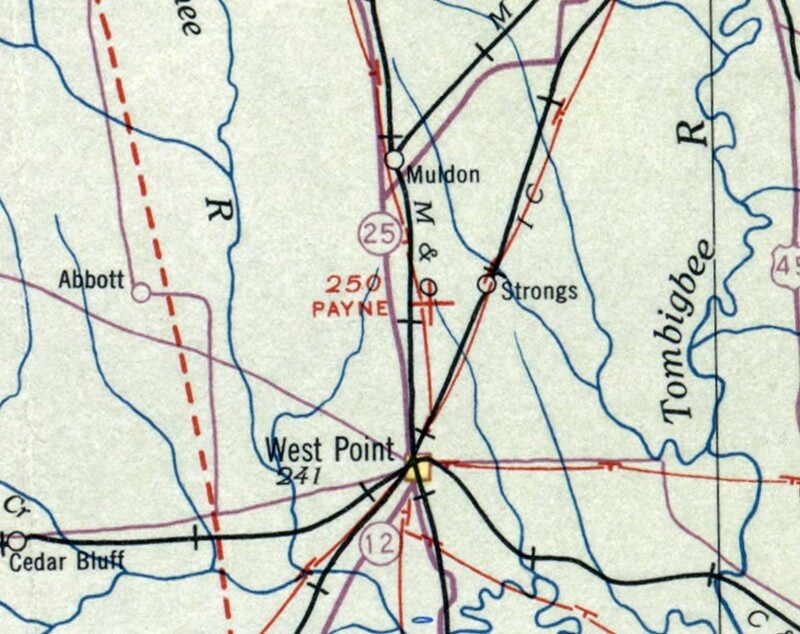 The first units stationed at Payne arrived in April, 1918, being transferred from Kelly & Ellington Fields, TX. However, only a few U.S. Army Air Service aircraft arrived with the squadrons. Most of the Curtiss JN-4 Jennys to be used for flight training were shipped in wooden crates by railcar. Payne Field served as a base for flight training for the United States Army Air Service. 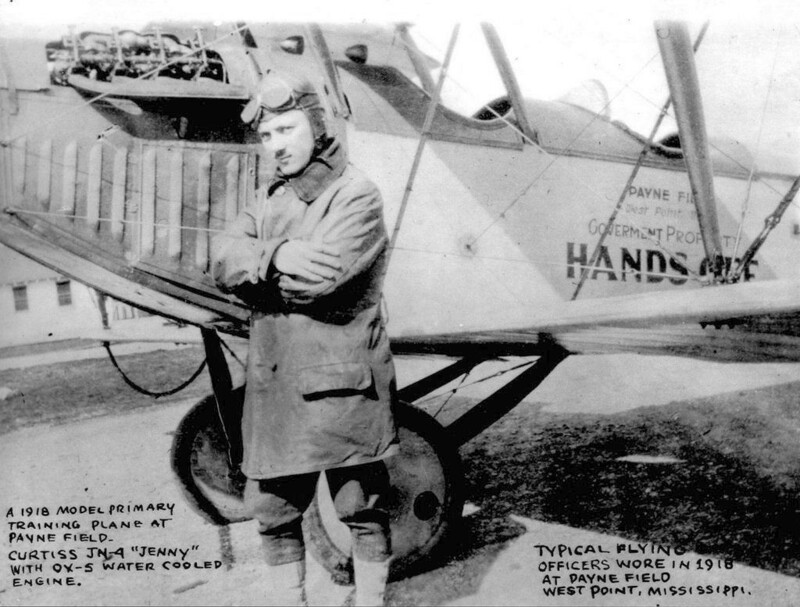 A 1918 US Army photo of a flying instructor in front of a JN-4 training aircraft at Payne Field. 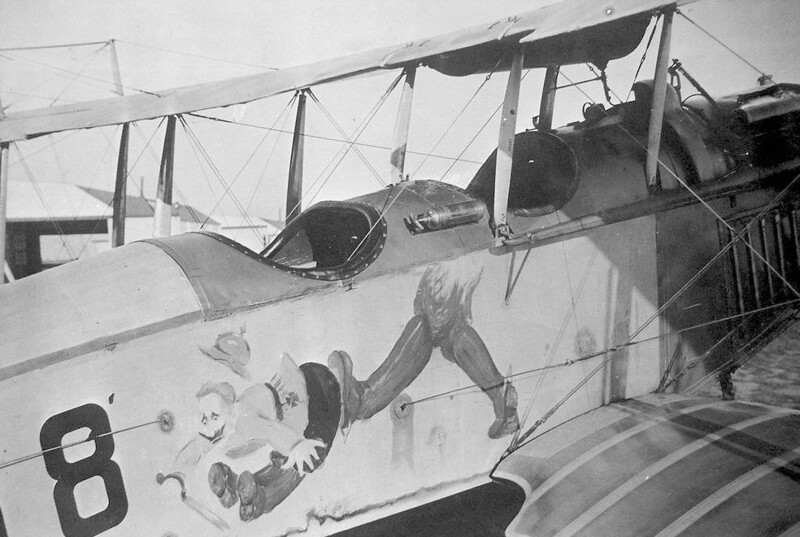 A 1918 US Army photo of fanciful art on the fuselage of a JN-4 training aircraft at Payne Field. 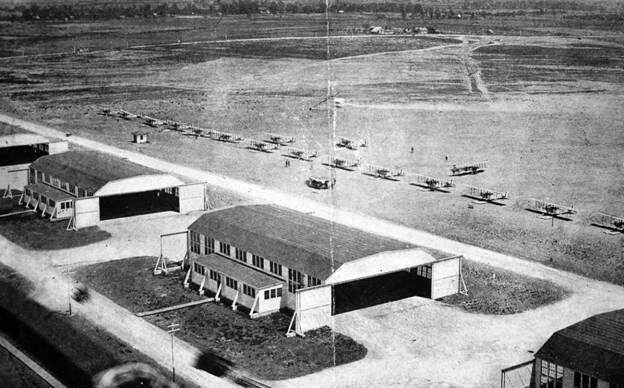 A 1918-20 US Army photo looking southeast at JN-4 training aircraft & hangars at Payne Field. A 2/11/18 plan of the buildings & hangars at Payne Field. Wikipedia continued, “In all some 1,500 pilots trained at the field during its operation. A 1918 US Army photo of the interior of the JN-4 aircraft repair shop at Payne Field. Wikipedia continued, “With the sudden end of World War I in November 1918, the future operational status of Payne Field was unknown. Many local officials speculated that the U.S. government would keep the field open because of the outstanding combat record established by Payne-trained pilots in Europe. Cadets in flight training on 11/11/1918 were allowed to complete their training, however no new cadets were assigned to the base. Wikipedia continued, “Payne Field played a role in one of the milestones of aviation. The first North American transcontinental round trip flight occurred in 1919. The flight by Major Theodore Macauley & his mechanic, Pvt. Staley, began in January 1919. Macauley was flying west from Montgomery, AL, in a De Havilland DH-4 when its propeller was damaged during a rain storm. He was able to land at Payne Field for repairs & then continued on to complete his historic trip. however, and a small caretaker unit was assigned to the facility for administrative reasons. It was used by the aerial forestry patrol. It also was used intermittently to support small military units. However, the decision had been made to phase down all activities at the base in accordance with sharply reduced military budgets, and it was closed. Wikipedia continued, “Shortly after it closed the Inter-State Airplane Company of Dallas purchased much of the field. Their plan was to develop a 'municipal flying field' with passenger service from the east to Shreveport, Dallas, Ft. Worth & Wichita Falls. Payne Field may have continued to be reused for civilian aviation in some capacity, as it was still depicted on the April 1933 Birmingham Sectional Chart. After the end of military activities at Payne Field, a hangar was disassembled & sold to a company in nearby Tupelo. In 1934, the Gravlee Lumber Company moved to Tupelo from Nettleton & took over the building & used the former hangar for storage. The last aeronautical chart depiction which has been located of Payne Field was on the October 1935 Birmingham Sectional Chart. as it was no longer depicted on the April 1940 Birmingham Sectional Chart. 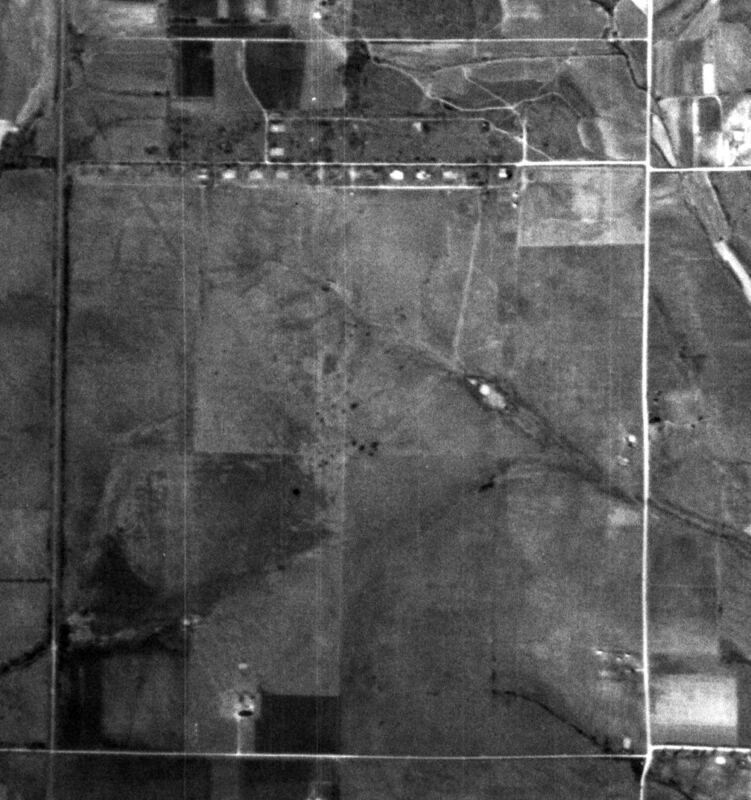 A 3/8/52 USGS aerial view of the Payne Field site showed the row of hangar foundations remained recognizable along the north side. 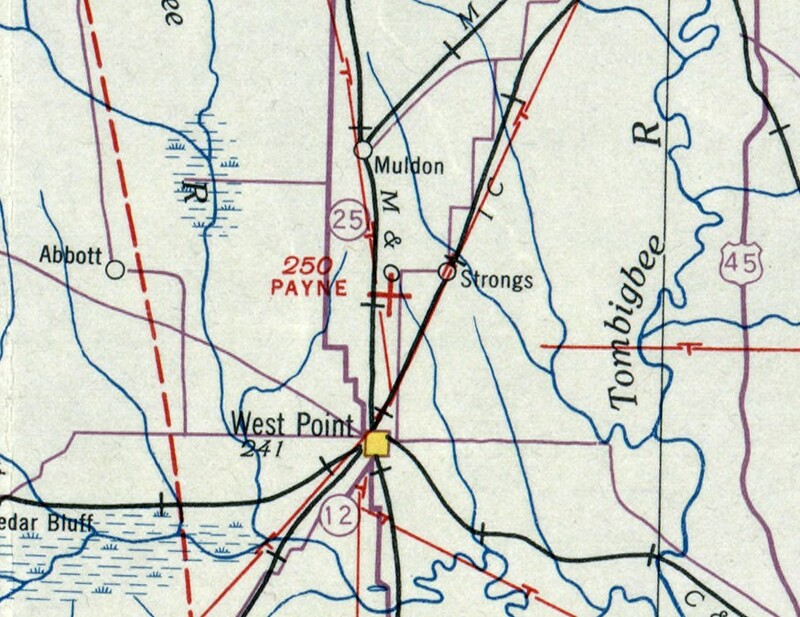 Nothing was depicted at the site of Payne Field on the 1960 USGS topo map. A historical marker was erected commemorating Payne Field on 8/23/68, on the occasion of a 50th Anniversary & Reunion. 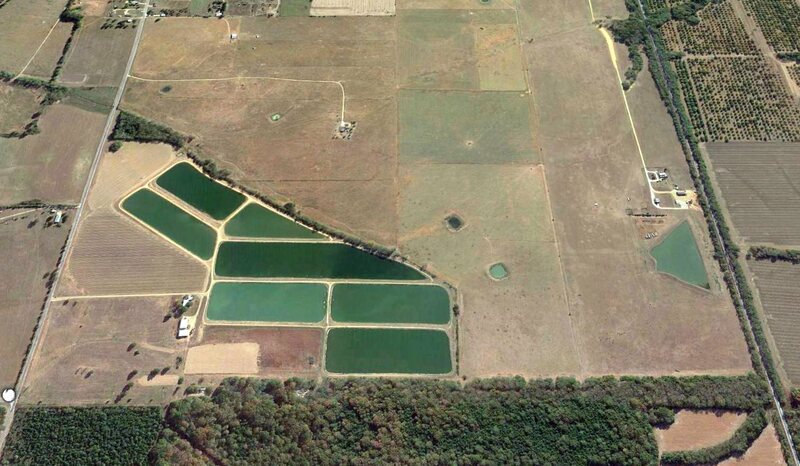 A 1996 aerial view of the Payne Field site showed the flying field had been reused for agriculture. The row of hangar foundations along the north side had been overgrown, but was still recognizable. An undated (pre-2012) photo of a former Payne Field hangar, moved to Tupelo & reused by the Gravlee Lumber Company. An undated historical marker commemorating Payne Field. A 2016 aerial view looking south at the site of Payne Field showed the location of the row of hangar foundations in the foreground (a wooded stretch along the northern property edge). The site of Payne Field is located at the intersection of Old Vinton Road & Payne Field Road, appropriately enough. Thanks to Jason Ward for pointing out this airfield. 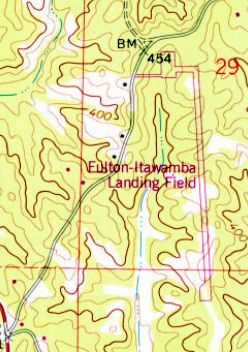 “Fulton-Itawamba Landing Field”, as depicted on the 1979 USGS topo map. as it was not yet depicted on the 1965 USGS topo map. 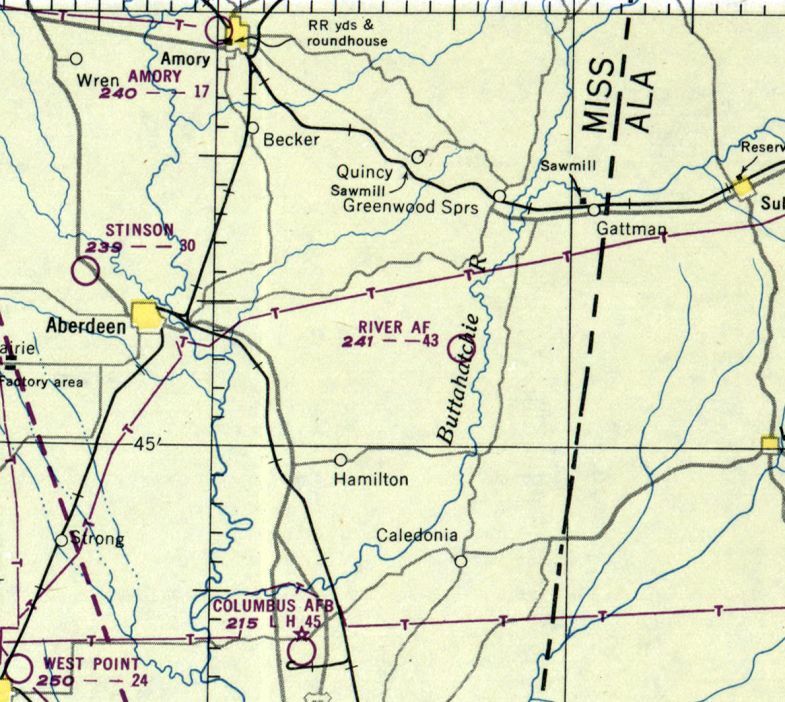 The earliest depiction which has been located of Fulton-Itawamba County Airport was on the 1979 USGS topo map. It depicted “Fulton-Itawamba Landing Field” as having a single paved runway with a paved ramp on the northwest side. Fulton-Itawamba County Airport was owned by Fulton-Itawamba County Airport Board. It comprised an area of 76, and had a single 3,000' asphalt Runway 17/35. 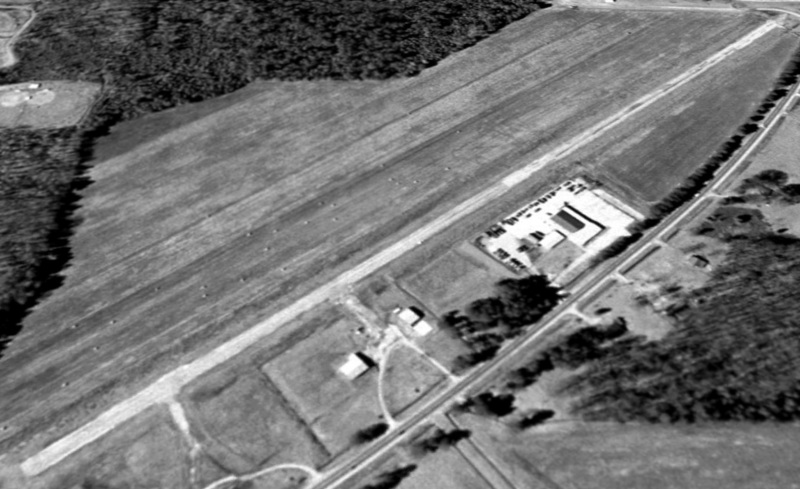 The earliest photo which has been located of Fulton-Itawamba County Airport was a 4/4/90 USGS aerial view. 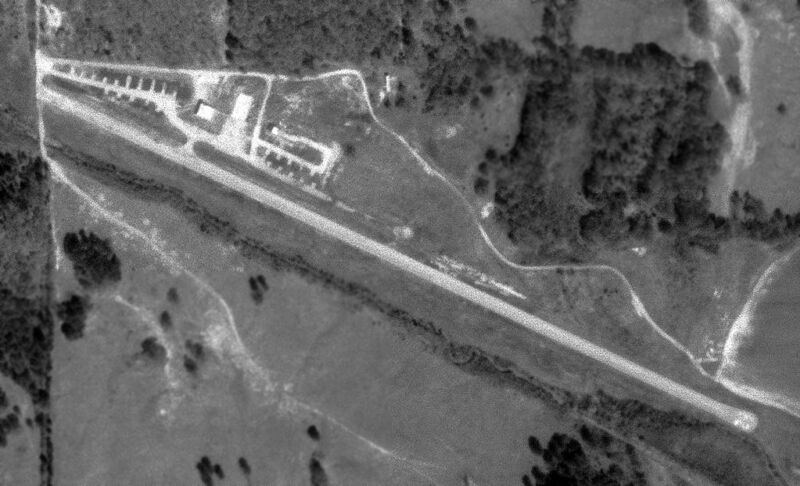 It depicted Fulton-Itawamba County Airport as having a single paved runway with a paved ramp on the northwest side. 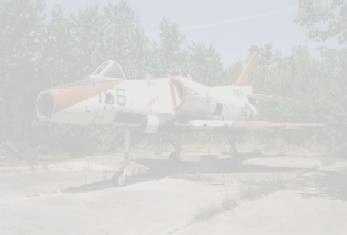 But there were no aircraft visible or any other sign of recent aviation use. 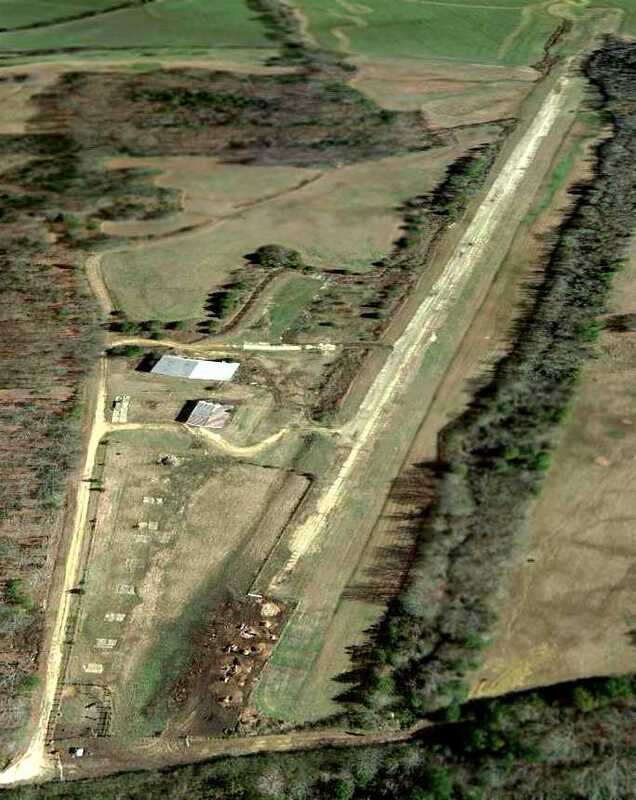 A 1/3/07 aerial view looking southeast at Fulton-Itawamba County Airport showed a small building had been added at some point between 1990-2007 along the northwest taxiway. But the runway was marked with multiple closed-runway “X” symbols, and the pavement appeared quite deteriorated. The reason for the airport's closure has not been determined. Fulton-Itawamba County Airport is located on the east side of Airport Road, appropriately enough. Thanks to Aubrey Patterson for pointing out this airfield. The date of construction of Stinson Field has not been determined. It depicted “Columbus AAF Auxiliary #7 (Stinson Field)” as an irregularly-shaped grass field, with several buildings along the road on the northeast side. 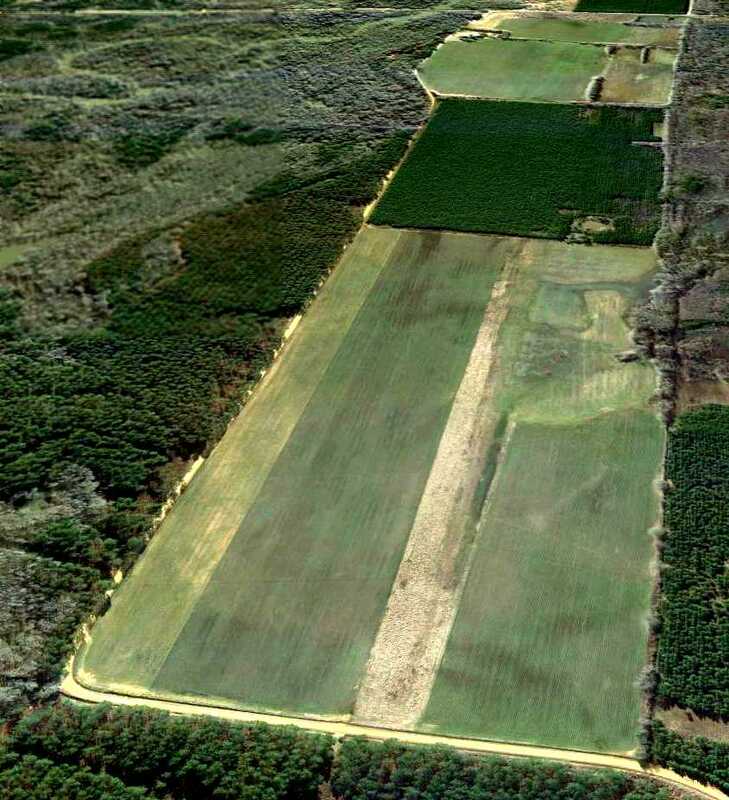 as a 109 acre irregularly-shaped property having a single 3,500' northwest/southeast sod runway. to be owned by private interests, but operated by the Army Air Forces. At some point after 1945, Stinson Field was relinquished by the military & reverted to its role as a general aviation airport. 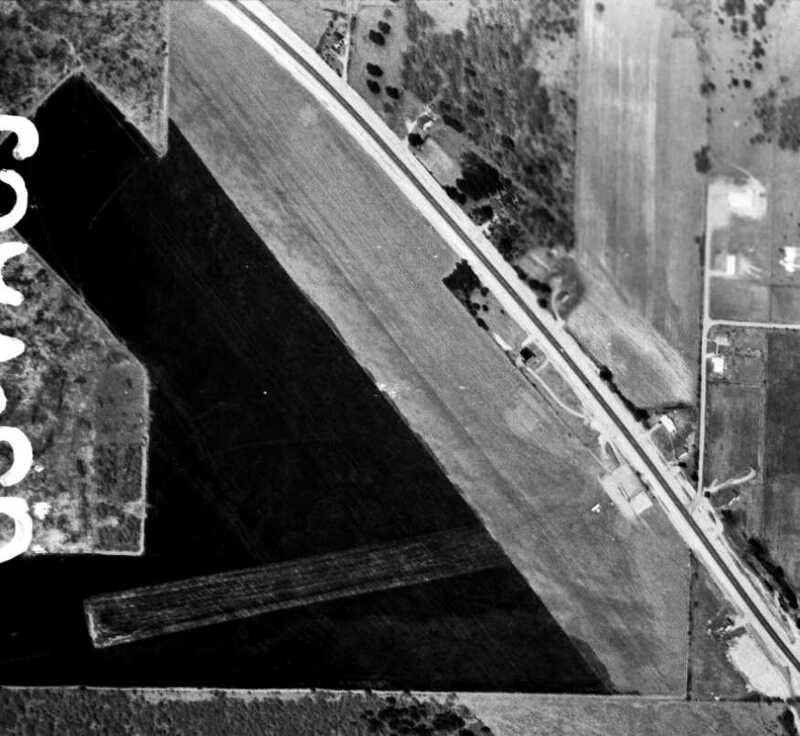 The only photo which has been located showing aircraft at Stinson Field was a 3/26/60 USGS aerial view. with 2 small buildings & one single-engine aircraft on the east side. with 2 paved ramps & small hangars on the east side. The 1982 USGS topo map showed that the length of Stinson's runway had been nearly doubled to 3,400', having been lengthened toward the northwest. with two ramps & several small buildings on the east side. but there were no aircraft visible on the field, so it is indeterminate whether the field was still operational at that point. 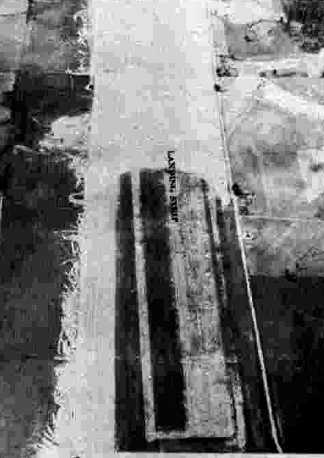 showed the remains of the runway pavement, along with the ramp, and foundations of several buildings. A 4/15/11 photo by Matthew Nichols of a memorial to Eddie Stinson located in a small park next to the hangar foundations at the site of Stinson Field Municipal Airport. 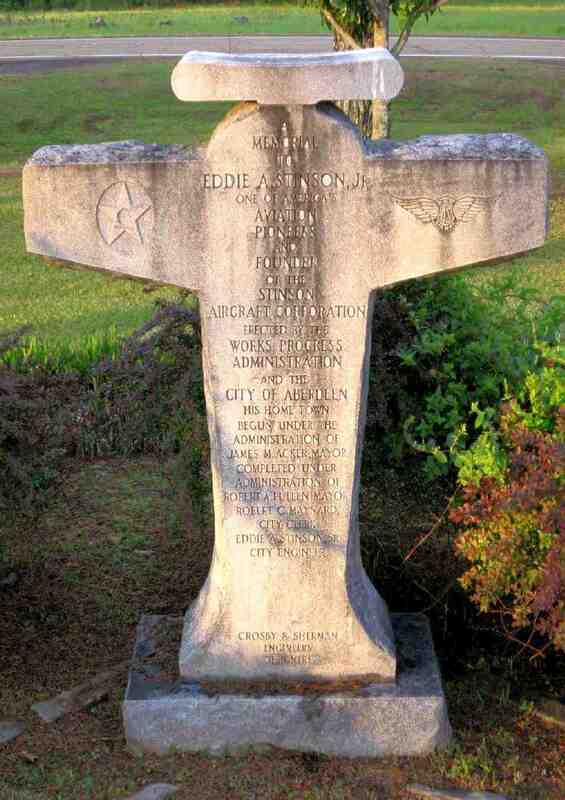 The monument reads: “A memorial to Eddie A Stinson Jr. One of America's aviation pioneers & founder of the Stinson Aircraft Corporation. A 4/15/11 photo by Matthew Nichols looking south at a “sign on the north end of the former Stinson Field Municipal Airport indicating its current use as an industrial park. The remaining strip of runway can be seen behind the sign. A 4/15/11 photo by Matthew Nichols looking southeast “down the remaining strip of runway at the site of the former Stinson Field Municipal Airport. 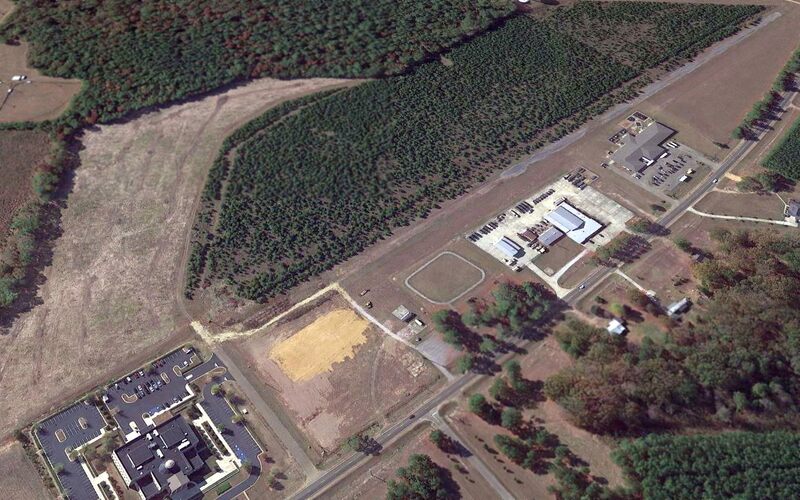 but a school had been built adjacent to the northwest side of the runway, and the Northern Mississippi Bankruptcy Court covered the southeast end of the runway. 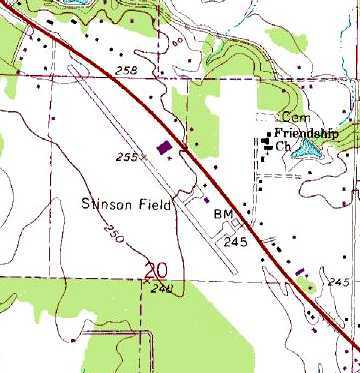 The site of Stinson Municipal Airport is located south of the intersection of Route 45 & Stinson Road. Thanks to Bud Green for pointing out this airfield. Tupelo Industrial Airpark, as depicted on the 1983 USGS topo map. as it was not yet depicted on a 1977 USGS aerial photo nor on the 1979 USGS topo map. 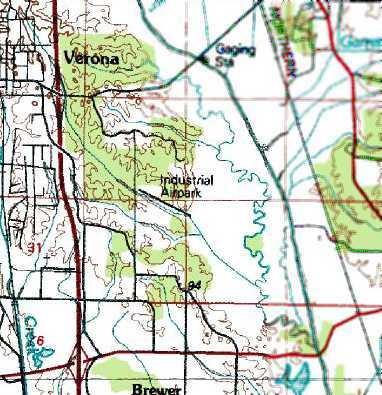 The earliest depiction of the Tupelo Industrial Airpark which has been located was on the 1983 USGS topo map. It depicted the “Industrial Airpark” as having a single northwest/southeast runway. 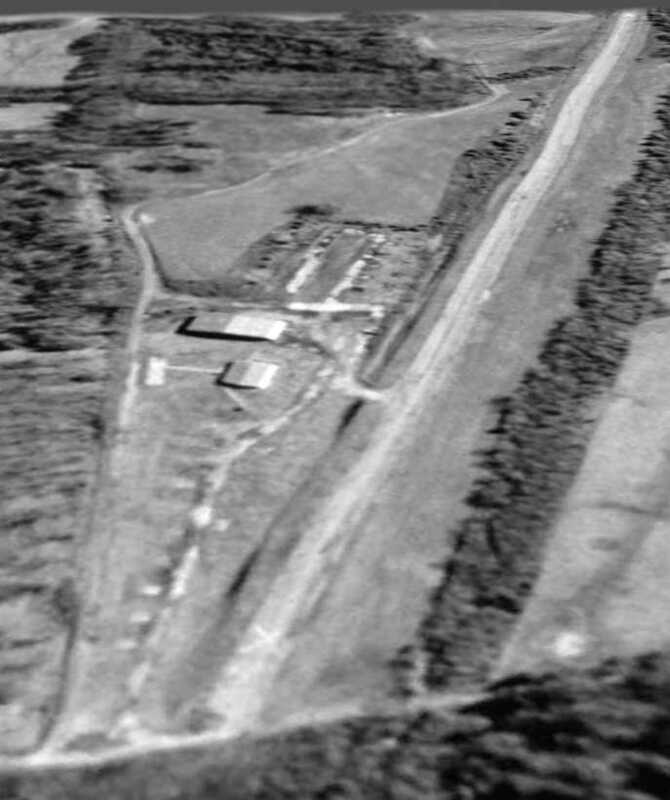 The earliest photo which has been located of the Tupelo Industrial Airpark was a 4/4/90 USGS aerial view. It depicted the field as having a single paved southeast/northwest runway, and a hangar & multiple parking spots on the northwest side. The airport may already have been abandoned by this point though, as there were no aircraft visible on the field. The Tupelo Industrial Airpark was still depicted as an active airfield on 1991 aeronautical charts. 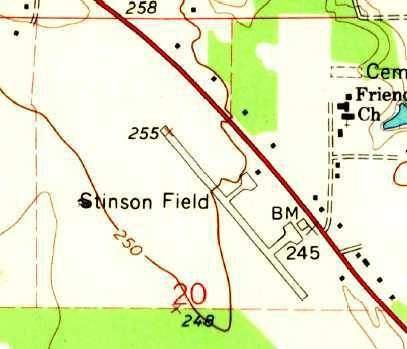 as it was depicted as an abandoned airfield on the 1995 Sectional Chart. 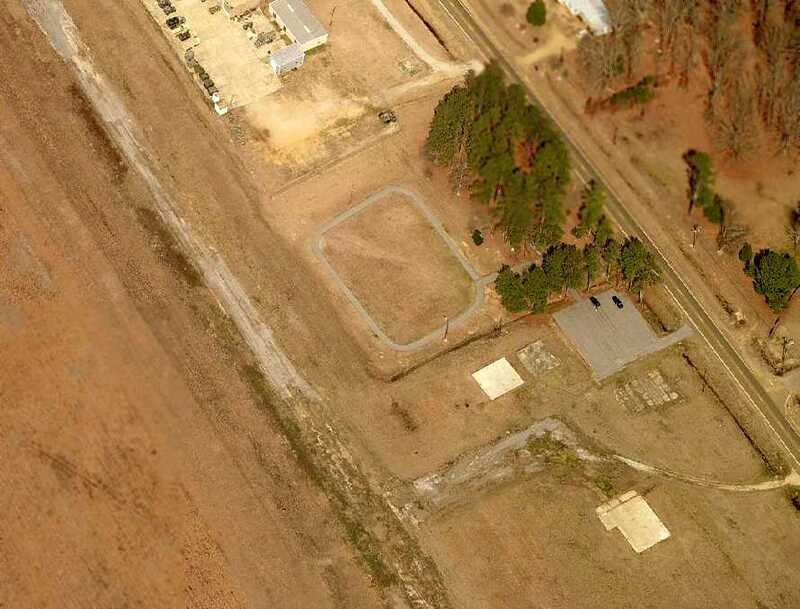 A 1/19/97 USGS aerial view looking east depicted Tupelo Industrial Airpark as having a single paved southeast/northwest runway, marked with closed “X” symbols. Two hangars & possible foundations of other buildings were located on the northwest corner. showed the runway pavement in a significantly deteriorated state. and a deteriorated paved ramp. 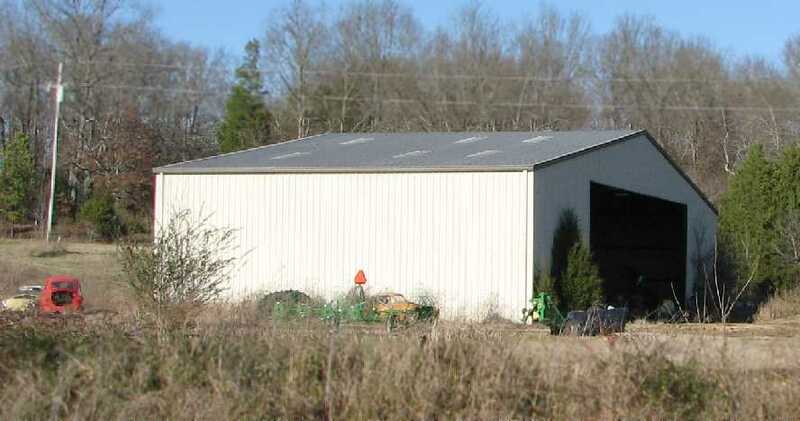 A January 2009 photo by Matt Nichols looking north at a former Tupelo hangar. 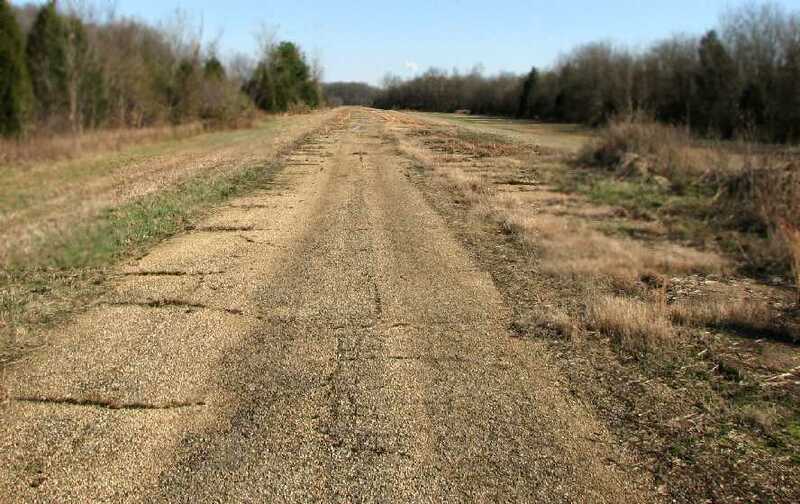 A January 2009 photo by Matt Nichols looking southeast along the remains of the Tupelo Industrial Airpark runway. 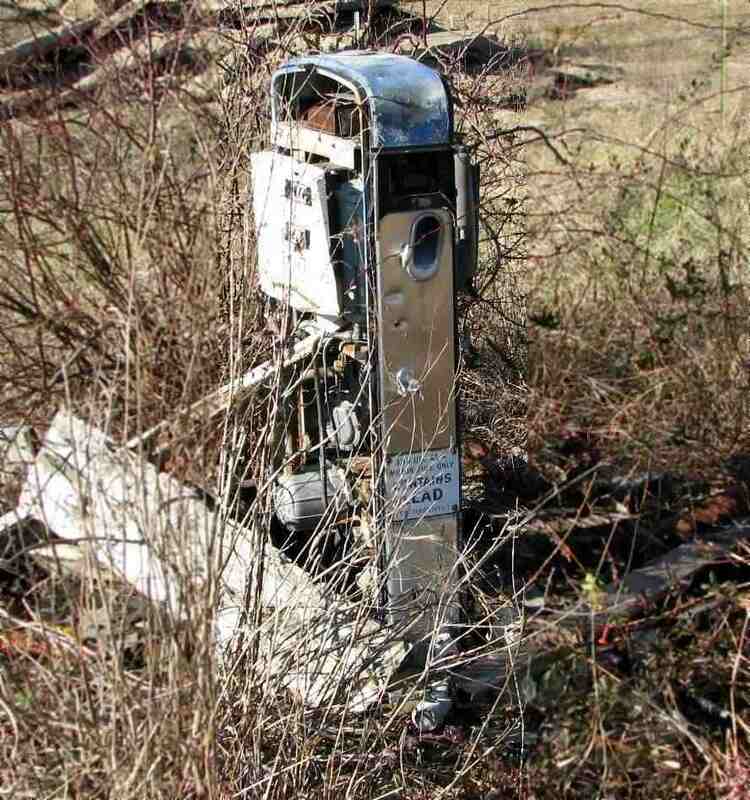 A January 2009 photo by Matt Nichols of a former fuel pump at Tupelo Industrial Airpark. Matt remarked the the pump had “a LEAD warning sticker. It was located next to the concrete tie-down pads, but I couldn't tell if this pump was used for aviation purposes or not. 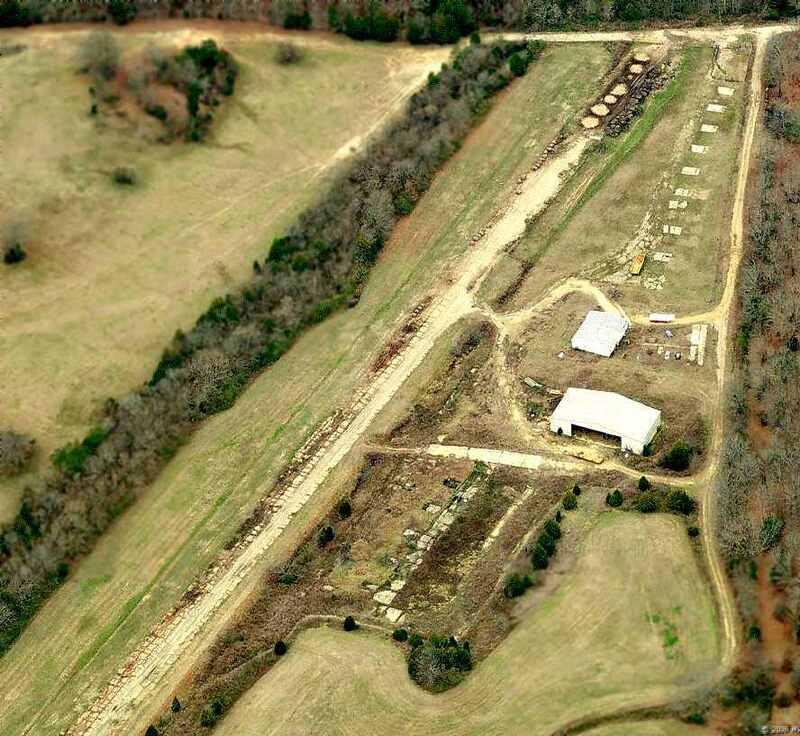 A 1/18/13 aerial view looking east depicted Tupelo Industrial Airpark as deteriorated but without any redevelopment. The site of Tupelo Industrial Airpark is located southeast of the intersection of Road 753 & Road 711. Thanks to Matt Nichols for pointing out this airfield. which conducted training in twin-engine bombers. 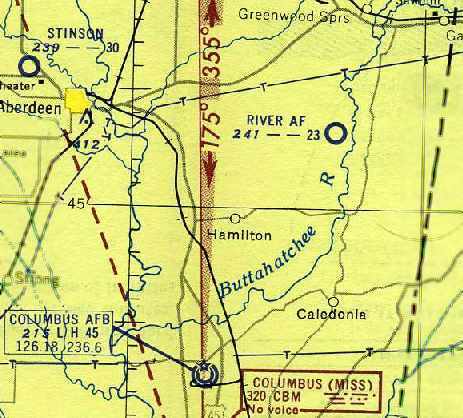 It depicted “Columbus AAF Auxiliary #2 (River Field)” as a single north/south runway, with a parallel taxiway. The airfield appeared to still be under construction, with only the southern half of the runway & taxiway having been built. as a 143 acre rectangular property having a single 4,000' north/south sod runway. or the April 1946 Birmingham Sectional Chart. 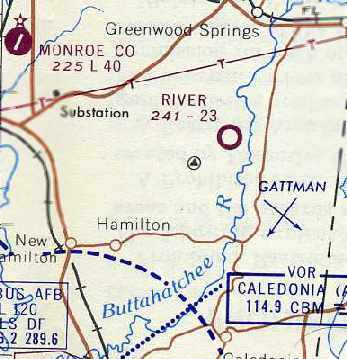 as it was depicted as “River AF” on the February 1950 Birmingham Sectional Chart. It was depicted as having a 4,300' unpaved runway. 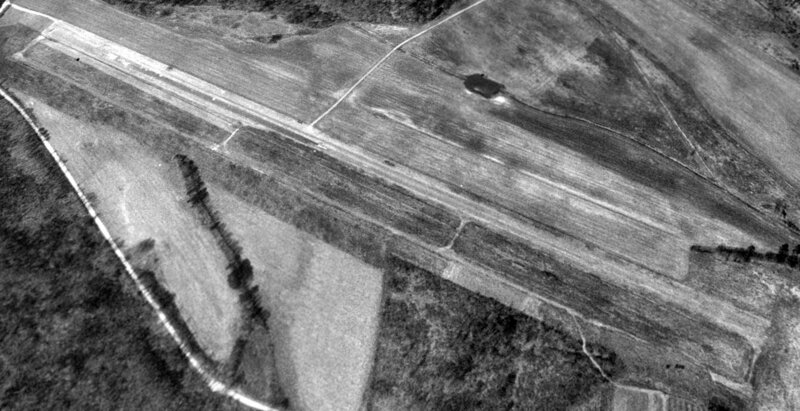 The use of the River airfield by the Air Force in the 1950s reportedly lasted only a few months. and depicted as having a 2,300' unpaved runway. “River” was depicted as a civilian airfield, with a 2,300' unpaved runway. on the June 1961 Boston Mountains World Aeronautical Chart (courtesy of Chris Kennedy). was on the August 1963 Birmingham Sectional Chart (courtesy of Chris Kennedy). It depicted River as having a 2,300' unpaved runway. as it was no longer depicted at all on the 1970 or 1980 USGS topo maps. 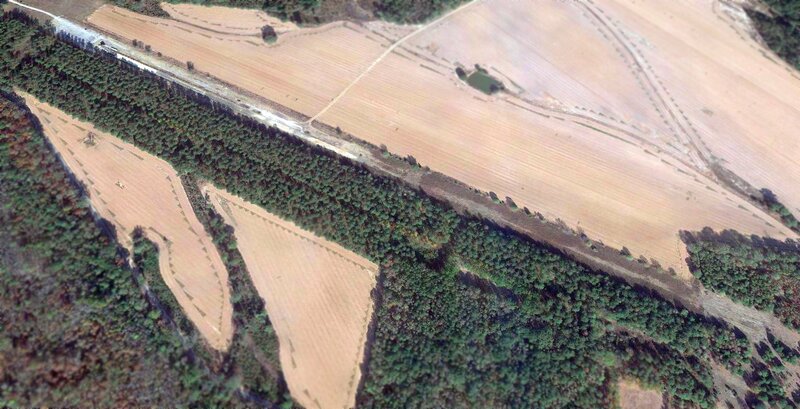 The outline of River Airport's runway was very distinct in a 1/18/13 aerial view looking southeast. Thanks to Steven McNicoll for information about River Airport. 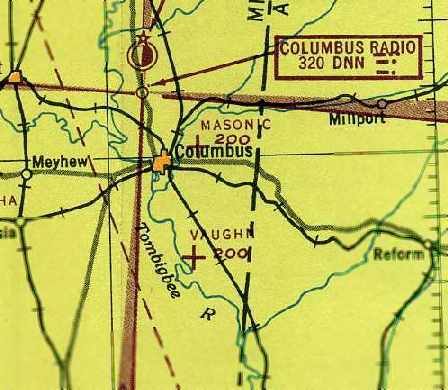 It depicted “Columbus AAF Auxiliary #6 (Vaughn Field)” as a single northwest/southeast paved runway. 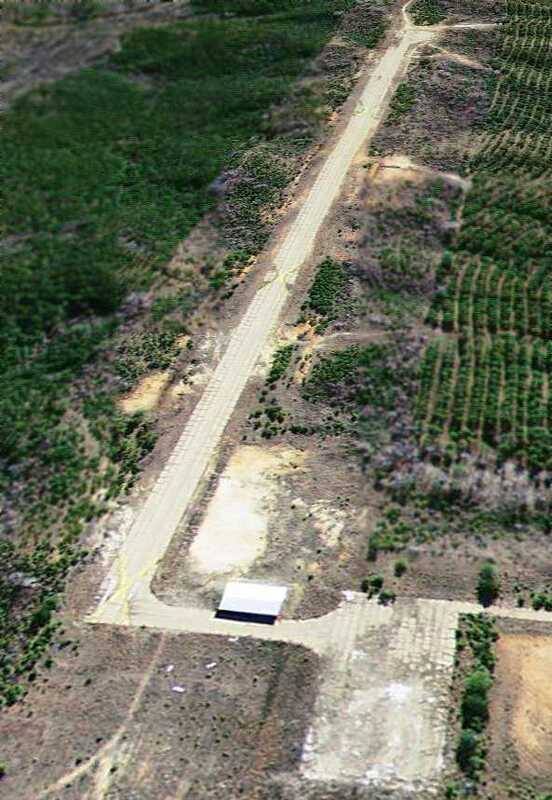 as a 68 acre irregularly-shaped property having a single 4,000' northwest/southeast bituminous runway. was on the October 1945 Boston Mountains World Aeronautical Chart (courtesy of Chris Kennedy). 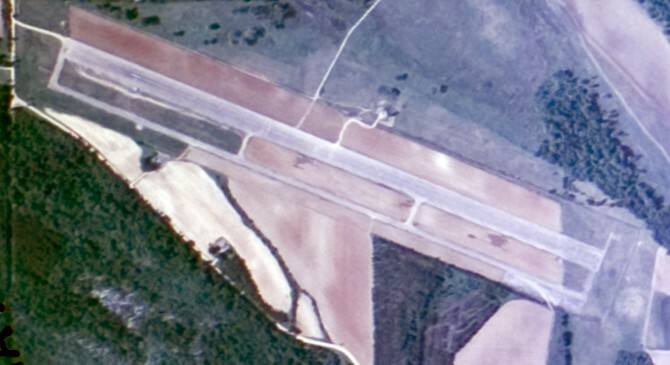 It depicted “Vaughn” as an auxiliary airfield. 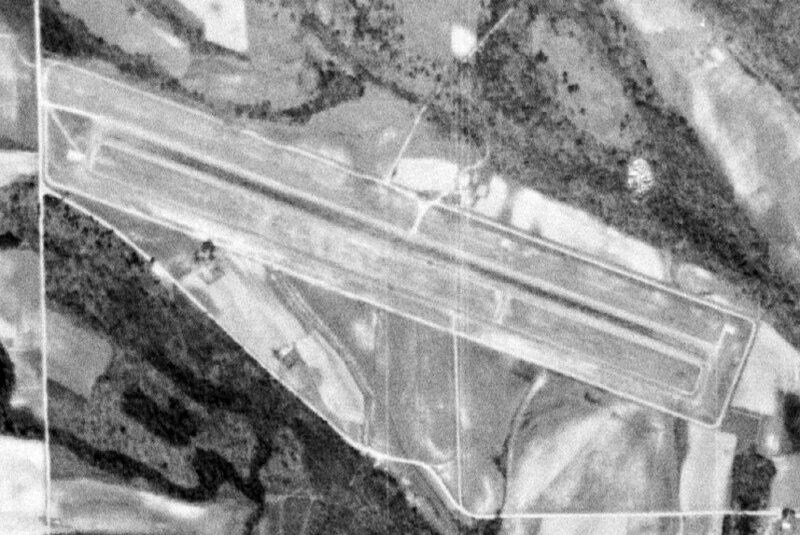 A 3/8/52 USGS aerial view depicted Vaughn Field as having a single paved 4,300' runway & a parallel taxiway. as it was depicted as “Vaughn AF” on the August 1954 Birmingham Sectional Chart (courtesy of Chris Kennedy). It was depicted as having a 4,000' paved runway. The use of Vaughn Field by the Air Force in the 1950s reportedly lasted only a few months. 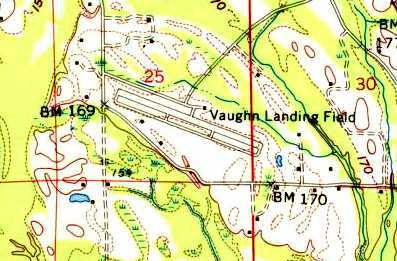 The 1960 USGS topo map depicted "Vaughn Landing Field"
as having a single northwest/southeast runway, with a parallel taxiway. 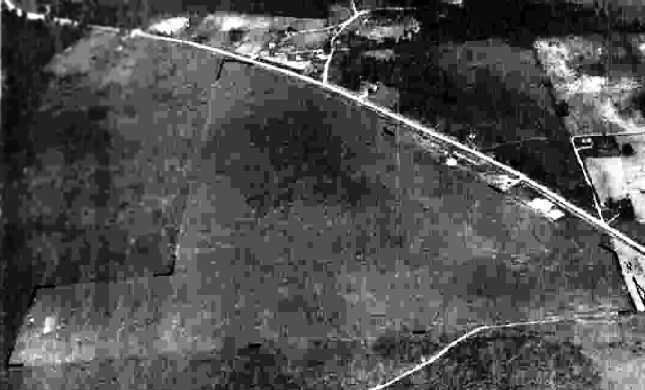 “Vaughn” was depicted as a civilian airfield, with a single 4,000' paved northwest/southeast runway. was on the June 1961 Boston Mountains World Aeronautical Chart (courtesy of Chris Kennedy). It depicted the field as having a 4,000' paved runway. as it was depicted as “Aband airport” on the the August 1963 Birmingham Sectional Chart (courtesy of Chris Kennedy). Vaughn Field was apparently reused for some period of time as a drag strip. and he believes that it was privately owned during that period. and possibly a small building on the north side. The 1980 USGS topo map depicted the "Vaughn Landing Field" as having a single northwest/southeast runway. with a single northwest/southeast runway & a parallel taxiway. It also labeled the road to the south as "Dragstrip Road". 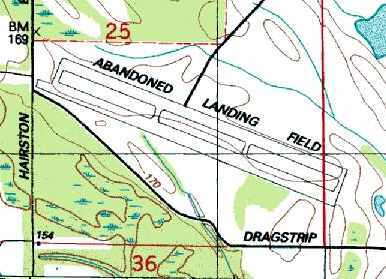 Vaughn Field was labeled "Drag Strip" on late 1990s aeronautical charts. A 2/19/92 USGS aerial view looking northwest depicted Vaughn Field as having a single paved 4,300' runway & a parallel taxiway. There was no indication of any buildings at the site. but trees had grown up to surround its parallel taxiway. Thanks to Steven McNicoll for information about this field.